, : Sector cleared. Place on location. 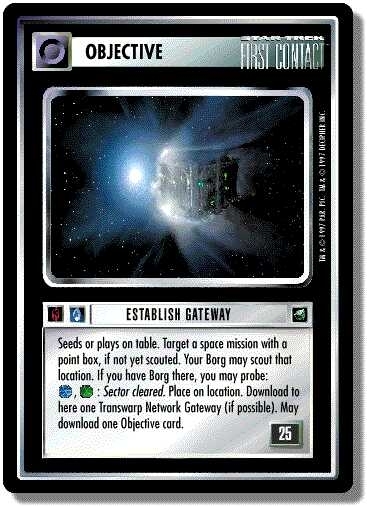 Download to here one Transwarp Network Gateway (if possible). May download one Objective card. Point-Box on card: 25 bonus points (you score points, when you play or use this card). : Sector cleared. Place on location. 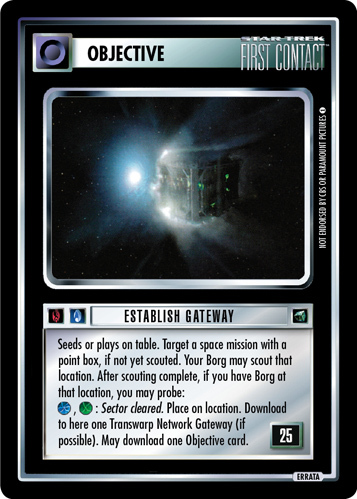 Download to here one Transwarp Network Gateway (if possible). May download on Objective card." There are 23 entries for Establish Gateway (ST1E 4 C 70) at the Tradeplace (70 haves and 1 wants). Click here to see all trade list entries for this Common card!